Finally, spring has come to Long Island for a full week! It's been a week of celebrating all "things" related to spring: a changeover in closets, walks in the neighborhood, a fond remembrance of a trip to the boardwalk, and topped off with poetry writing. Lately, my umbrella and sunglasses take turns as the accessory of the day while my iPhone, always busy capturing nature, is a faithful companion. Here on Long Island, spring is a celebratory experience after a long #winterinspring phenomenon that led me to unveil my Winter Wonderland Gallery of Artistic Expressions. 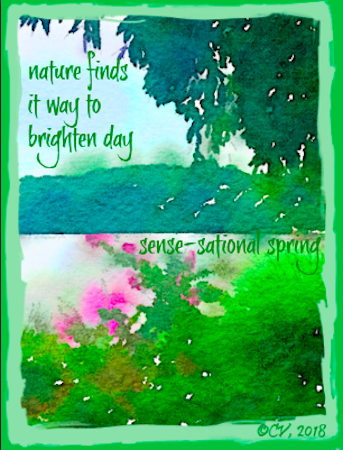 Now, the weather has settled into a spring pattern of sun and rain and so, I took the opportunity to send out an invitation to my spring gallery, Sense-sational Spring. All this talk of spring has inspired me to continue to write poetry and create digital art. Life is full. Even the birds have returned to their daily practice of awakening morning each spring day. 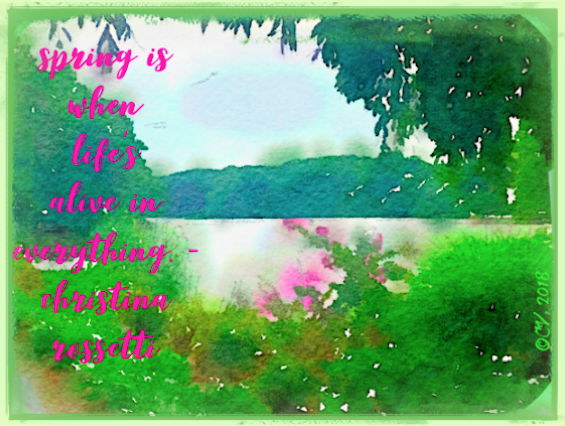 "Spring is when life's alive in everything!" This quote from the 19th century poet, Christina Rossetti, has given rise to a flurry of digitals on social media. I couldn't resist using one of my favorite spring scenes of the preserve north of Sleepy Hollow, New York to create a digital inspiration. I hope this creation brings you a sense of peace and the interest to capture your own spring scenes. 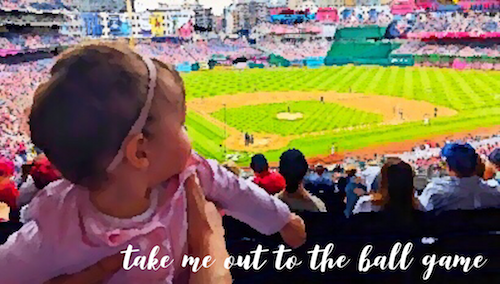 For all the baseball fans, the season is upon us and even my grandbaby is enjoying spring at a ball game. Are you feeling the spring-is-in-the-air love? Only 2 more days to enjoy National Poetry Month with the amazing poetry that is happening on and off-line. You still have time to check out the poetry happenings at Jama Rattigan's 2018 National Poetry Month Kidlitosphere Events Roundup. Click here for the calendar. I know that I have some catching up to do myself. Signing off with more #poetrylisciouspoetry creations in mind. I Celebrate This Week with Ruth Ayres at her site on the weekends and post at #celebratelu. What are you celebrating this weekend?